Night falls on Lustria. As you stand on the dock and peer seawards through the gathering mists, strain your ears. The jungle sounds behind you fade, and in their place comes a wet thudding, as of rotten rigging against a mouldy mast. The sound multiplies, and with it, the groan of a thousand breathless voices, joined in something part-shanty, part-dirge. Dread prows pierce the gloom ahead, and the ghastly truth is laid bare: upon the ghoul-winds come the swollen hulks and decaying vessels of the Vampire Coast! Run now – run hard and fast. For it is all you can do. It was the undying lord Luthor Harkon that laid claim to a stretch of Lustria’s east coast. Ever since, it has been a domain where the dead stir, leading expeditions into the jungle interior or setting sail across the Great Ocean to commit wanton acts of piracy. But the insane Arch-Commodore Harkon is not the only unliving admiral who takes to the seas with pistol-armed crews of zombies, vampiric depth guard, syreens and mournguls… there are other pirate lords who command dreadfleets of their own, packed to the gunwales with crews press-ganged into eternal service. These tyrants ply the seas seeking plunder of blood and gold. However, now that the vortex of Ulthuan weakens, the captains search for more than mere treasure… for the Star-Metal Harpoon lies in the deeps, a weapon powerful enough to bring the greatest Merwyrm of them all to heel! New roster: command towering constructs, ghastly pincered sea-beasts, ghoulish horrors and musket-wielding piratical zombie hordes in battle! The great Merwyrm Amanar has been awoken from its slumber by the vacillations of the Great Vortex. It terrorizes the sea lanes, summoning vast storms and attacking coastal ports on a whim. Only one who wields the Star-Metal Harpoon will tame the beast and become immune to its ravenous hungers. However, the Harpoon must first be found, and invigorated using the three verses of a secret, ancient sea-shanty. 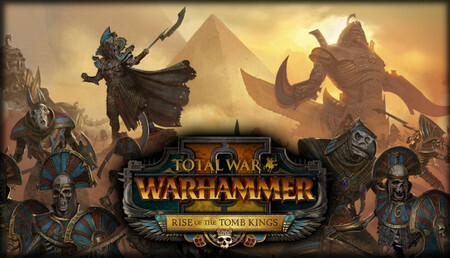 Each playable Legendary Lord must grow their dread reputation to become the most Infamous pirate on the seas. Certain opposing Pirate Captains know the three verses of the ancient shanty and, as your Infamy rivals theirs, they will seek you out in attempt to destroy you. If you best each in battle, you’ll learn each of these verses, all three of which are required to magically charge the Star-Metal Harpoon. Only with the fully-powered Star-Metal Harpoon in hand can you embark on the final, fateful battle, bend Amanar to your will, and become the greatest sea-scourge the world has ever seen! As your faction wins battles, takes territory and establishes Pirate Coves (see Pirate Coves below), Your Legendary Lord’s Infamy grows amongst the ranks of pirate lords and ladies. This is the route by which you reach ultimate victory in a Vampire Coast campaign (please see Objectives above). 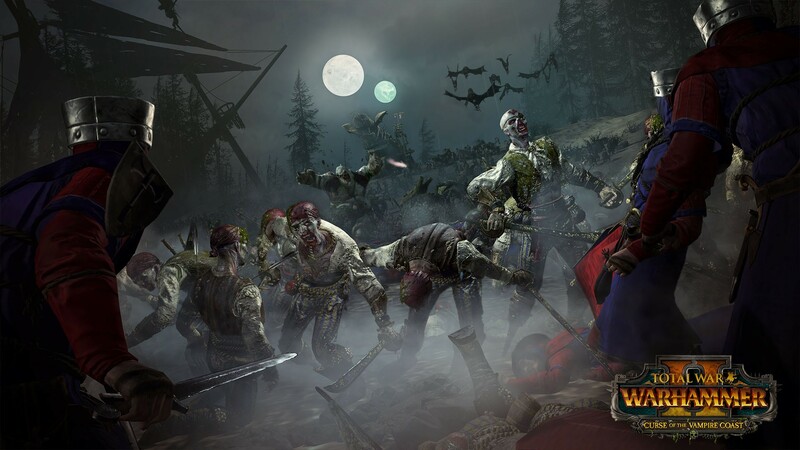 After a victorious port-settlement battle, Vampire Coast factions may choose a new post-battle option. Instead of taking, sacking or razing the port, the faction may choose to establish a Pirate Cove in the vicinity. These secret sub-settlements can siphon a steady flow of income from the main settlement, and bring other benefits related to any upgrades the player chooses to build in the Cove. The Cove can only be destroyed if the settlement itself is razed. In addition, a competing Vampire Coast faction which conquers the settlement may commandeer the Cove for itself. Legendary Lords sail in their own unique ships. 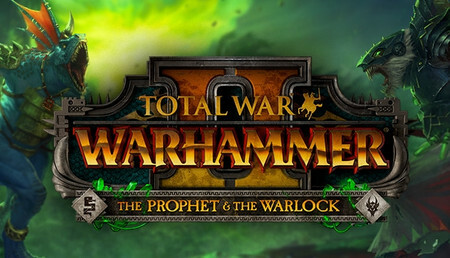 Details of these ship are accessed via the Lord in the same fashion as Horde Buildings for Horde Factions, and contain many powerful upgrades for the Lord and his army. This does not make them a standard Horde faction however. 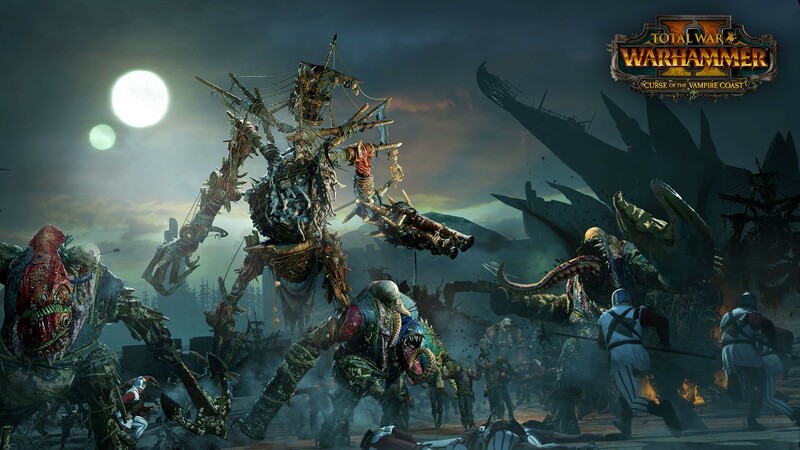 Vampire Coast lords may also occupy settlement like any other non-horde faction, and may develop it using the unique new Vampire Coast building tree. 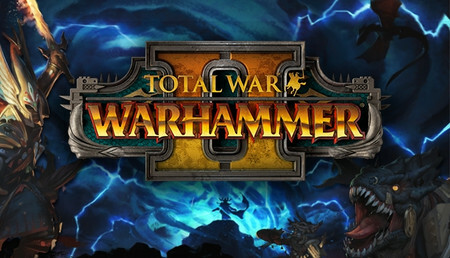 In short, they benefit from the best features of both Horde factions and Settled factions. Carefully hidden around the world are eight unique golden tokens. 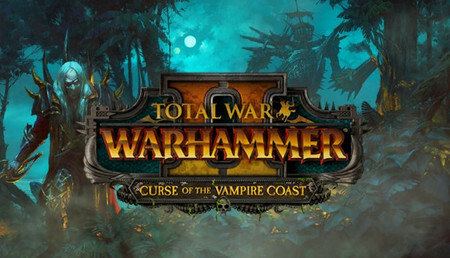 Locating each and defeating its powerful guardian army will grant access to the Vampire Coast Regiments of Renown, powerful elite variants of units in the terrifying Vampire Coast roster. 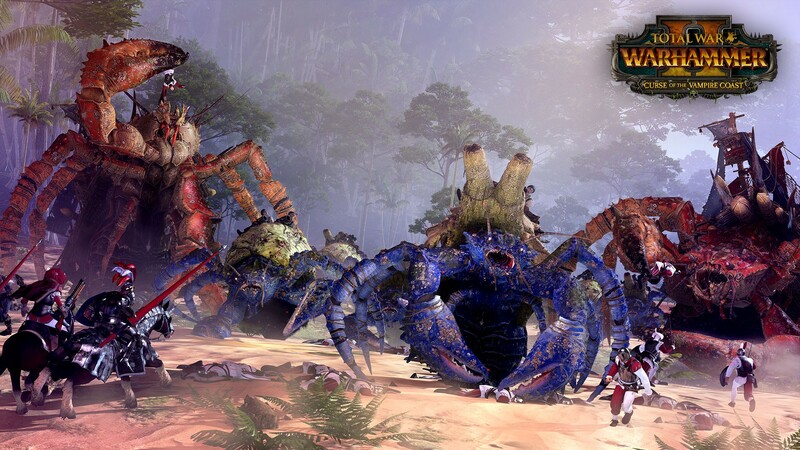 Vampire Coast factions gain access to four unique new Rites, granting a variety of bonuses. Curse of the Queen’s Cannon, for example, grants access to Queen Bess, a vast, one-off ship’s cannon which fires colossal cannonballs in a high parabolic arc, dealing tremendous area-effect damage and slowing those affected by the shockwave. Another, Curse of the Sea Mist, shrouds all your regions with a clinging maritime miasma, causing attrition to your enemies and granting Vanguard Deployment to your Monster units. 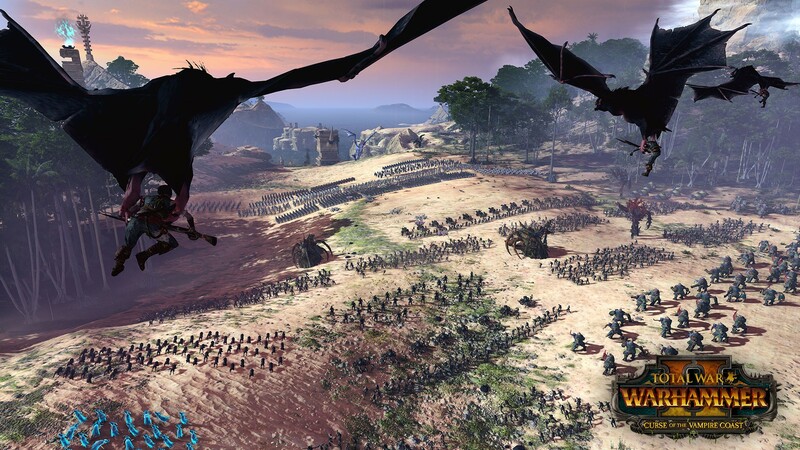 New Island Maps Broaden Total War: WARHAMMER II’s battlefield environments and, for the first time, players may now attack and defend Dark Elf Black Arks in battle, fighting with their assembled land forces on the lofty slopes of these vast seagoing structures. 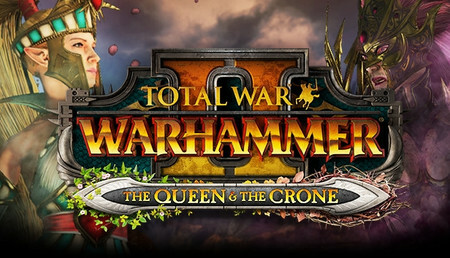 These new maps will be available to all WARHAMMER II players, regardless of Curse of the Vampire Coast ownership. 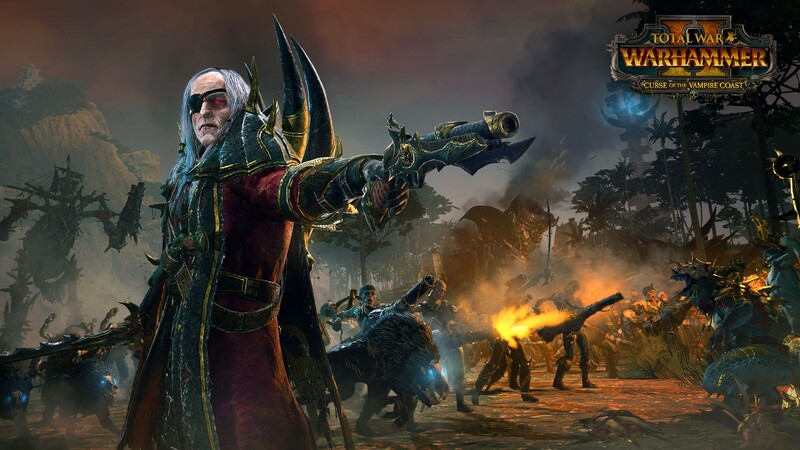 For centuries, Arch Grand Commodore Luthor Harkon has ruled a stretch of Lustrian shore known as the Vampire Coast. While assaulting a hidden chamber, powerful glyphs rebounded Harkon’s sorcery, shattering his mind into many warring personalities and severing him from the Winds of Magic. Harkon’s multiple identities now battle for dominance but they have one common goal, to plunder the sacred places of the Lizardmen and use the power of their Slann artefacts to break the curse and heal his damaged mind. Count Noctilus, once known as Nyklaus von Carstein of Sylvania, was drawn to the maelstrom at the heart of the ocean to feast upon its dark magic. He performed a mighty ritual to transport himself, his castle and all his undead minions there to the Galleon’s Graveyard, a mystical place where wrecks and hulks of the seas are drawn. Reborn as Count Noctilus, he raised the shattered remains of sunken warships to form the hull of the Bloody Reaver and ride the waves of the mortal seas once more. Queen of the Tides, Aranessa Saltspite is one of the most respected and feared pirate captains of Sartosa. Some say she is the daughter of the sea god Manann himself and he whispers to her to take control of all the world’s oceans. Now, many a sea-bloated corpse washes up against the Swordfysh’s hull, and so the Vampire first mates breathe unlife into them, creating a vast rabble of loyal crew, ready to serve at Captain Saltspite’s command. As part of the living realm rather than the undead, she commands a human pirate crew known as the Sartosa Free Company, otherwise reluctantly sharing control of the denizens of the Vampire Coast. Legend has it that the sea witch Cylostra Direfin was once the favourite court singer of the Bretonnian king. Sent on a voyage across the ocean to sing for the Phoenix King, they were hit by a fierce storm. The madame’s notes turned to screams of fury as the ship sank, and all onboard drowned. Decades later, a Bretonnian galleon of rotten wood and tattered sails can be seen navigating the seas even in the most savage of storms. It is The Lamprey, the ship of the vengeful spirit Madame Cylostra and her crew, the Drowned. Vampire Fleet Admiral with male and female variants. Un très bon DLC, il rajoute de nouvelles fonctionnalités qui sont très appréciable. ( exemple : Des criques Pirates à ajouter dans les villes adverses ). Toute la puissance de ces Vampires repose sur la poudre Noire ( Normal pour des pirates ), beaucoup d'unités de tir ( arquebusiers, canonniers etc ... ) et même D'artillerie ( Mortier, canon ou même la Grosse Bess qui est pour moi la meilleure artillerie du jeu ).